Patrick’s Hot and Sour Soup | So Hungary! If you haven’t noticed yet, I really like to make soups and stews. Every time I have ordered hot and sour soup at a restaurant, it has been pretty underwhelming and I can’t say I have ever been that fond of it. However, making hot and sour soup is entirely different. You can add your favourite vegetables or meat, and if you’re like me, make it as hot as you like. This is a great soup on a cold day or if you are feeling under the weather (as was the case this time), and it is very fast to make. I like to start this soup by chopping everything up before I add it to the pot. Start by removing the caps of the mushrooms, and slice thinly. Thinly slice the chilies, discarding the stems. Peel the ginger and grate it finely using a micro-planer, ginger grater, or putting it in a garlic press. Starting at the head of the Napa cabbage, slice thinly until you have cut up half of the cabbage. Slice the pork into long thin strips. Now we are ready to start cooking. Heat a few lugs of peanut oil in a large stock pot on medium high heat. Add the pork, season with salt and pepper, and stir fry until you have rendered all of the fat and the meat is cooked through. Remove the pork from the stock pot and add the ginger. Stir the ginger and cook for about a minute before adding the chilies, garlic, mushrooms. Cook for about 5 minutes until the mushrooms have browned slightly. Add the cabbage and pork back to the pan and cook for 2 minutes. Add all of the chicken broth, sesame oil, soy sauce, red pepper flakes, sugar, and bring the soup to a boil for 10 minutes. While the soup is simmering, mix the cornstarch and vinegar into a separate container, incorporating the corn starch into the vinegar. Once the soup has simmered for 10 minutes, add the vinegar/cornstarch mixture to the soup and let simmer for 2 minutes. The soup should thicken very slightly. Taste the soup and add as much lime juice to make it as sour as you like. Adjust the saltiness of the soup using more soy sauce if necessary, and add red pepper flakes to adjust the heat. The soup is now ready to serve as you like. 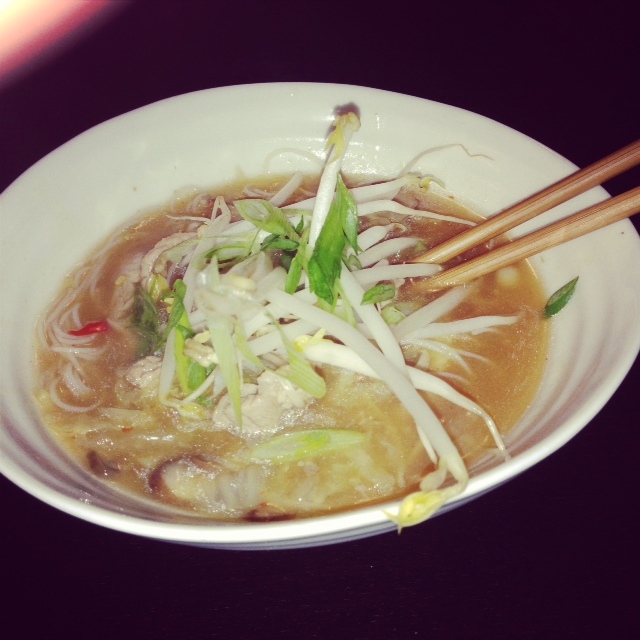 My personal favourite is to eat it this soup with rice noodles, garnished with bean sprouts and scallions. How you serve this soup is up to you! This is my favourite mix of ingredients, but please add or omit your favourite vegetables or meat to make this soup your own. Enjoy!